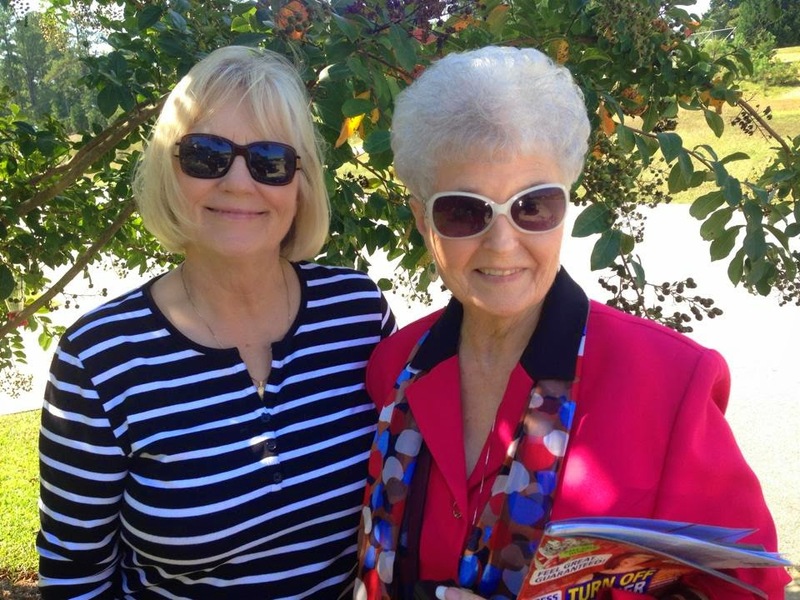 Written by Sue, Wednesday, August 27, 2014 Such a beautiful and pleasant day, temps.80's, Ahh! Where does one begin again while being so sporadic with keeping her blog updated? I have contemplated this question so much lately, (at one point thought of pushing the delete button), but just couldn't as blogging and blogger friends have become so much a part of my life, so once again I am attempting to journal here in blogland! 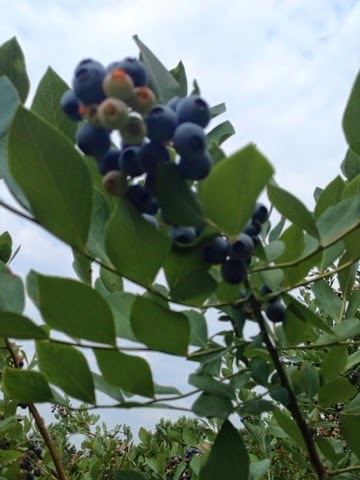 This summer, as most summers are on a farm, has been very busy with late to bed and early to rise. Our days begin with devotions, and coffee on the front porch, and always ending in the late evening with another cup of coffee,(decaf) on the back screened in porch( dodging those mosquitoes,) comparing notes of the day's events, and planning the next day's chores. This summer found a few challenges for me, but as always God is so faithful, he renews my strength from day to day! I have been studying to be certified as a CNA, something I have wanted to do for some time. If I were younger, I would try for the RN degree. ~smile~ Who knows, anything is possible! My mind and spirit are so young, now if my body would get the message maybe we would all be in sync.Ha! Ha! Anyone knowing this lady,(my Mom, mentor) knows this is true.Just look at that smile and those cute socks, she, by example, has always told her children we could be or do anything we wanted to. One of the best thing for me is, I will once again be able to blog, I have missed this so much, and Dh husband knows this, he is so sweet, the other morning after closing in prayer, and we were about to get going, he said, "I will be glad when this canning is over so you can get back to blogging, I know you have missed it!" OH, how right he was! I finished the tomatoes for this season, Whoopee!! 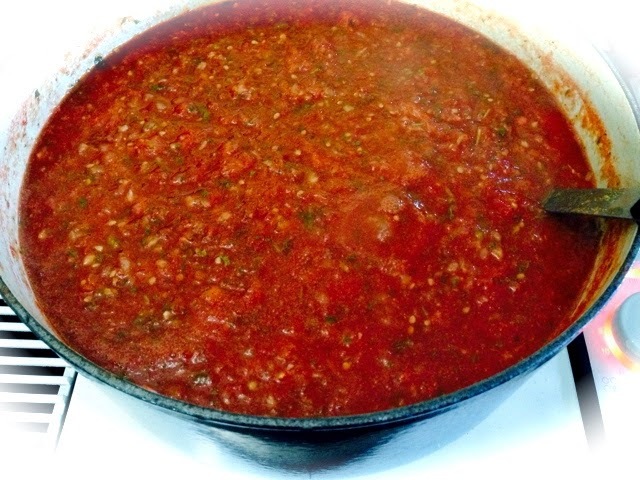 I made tomato salsa, and canned tomatoes.This is the best salsa evah! Daughter Susan gave it to me, and everyone knows SA Texas makes the best Salsa, the recipe comes from a dear Hispanic grandmother who operated a restaurant! 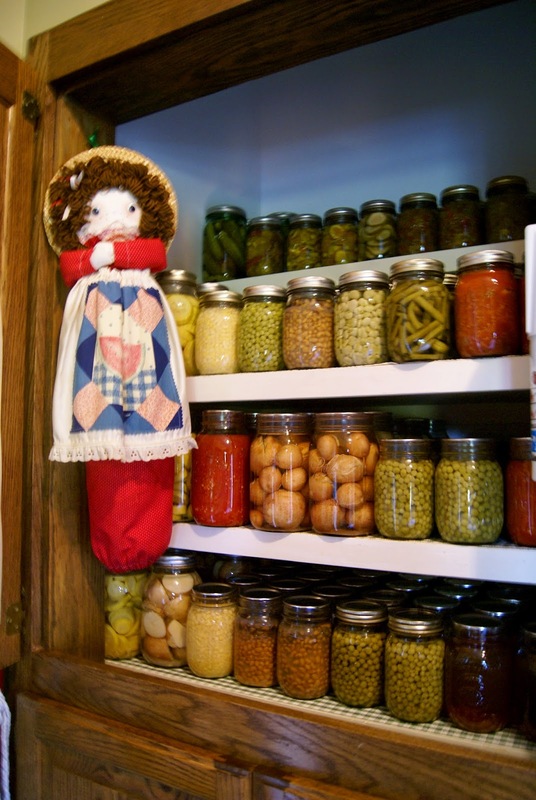 I am so thankful the pantry is once again restocked! Thanks for taking the time to stop by and say hi! Written by Sue, Wednesday,July 16, 2014 Clouds with showers, temps. 80's, a great day for blogging. 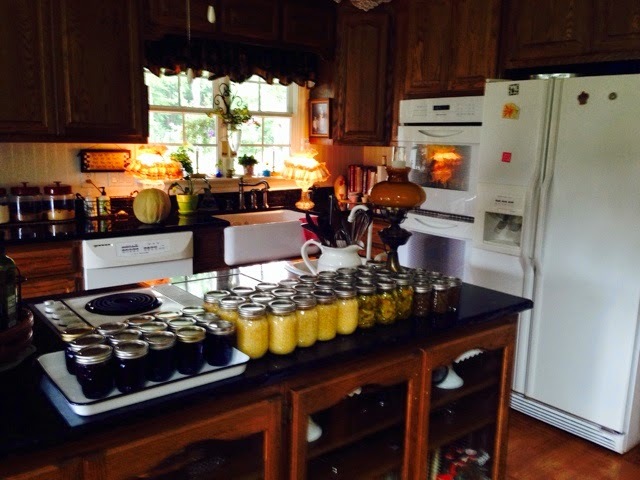 If you come looking for me from May through August you will probably find me here in the kitchen canning and preserving foods from the garden, or out in the garden. To plant a seed and watch it sprout,then grow into a beautiful plant that produces either fruit or veggies, and then to be able to gather the fruit, walk a few steps into your kitchen and begin to create your master pieces is so rewarding. A big hug and thank you to my two, ever present helpers, I could not do this without your help and support! 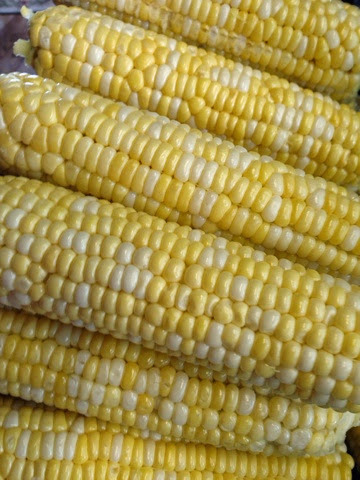 This corn is called Ambrosia, so sweet, this was our first year growing this variety! 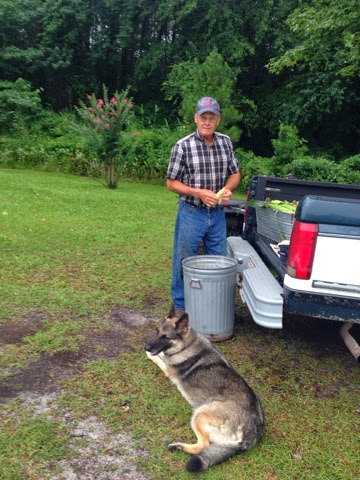 We finished canning the corn yesterday. I had 54 pints, you might ask why so many, it is divided with our children who live many miles away, our deal is this, we grow and preserve they pay for shipping! 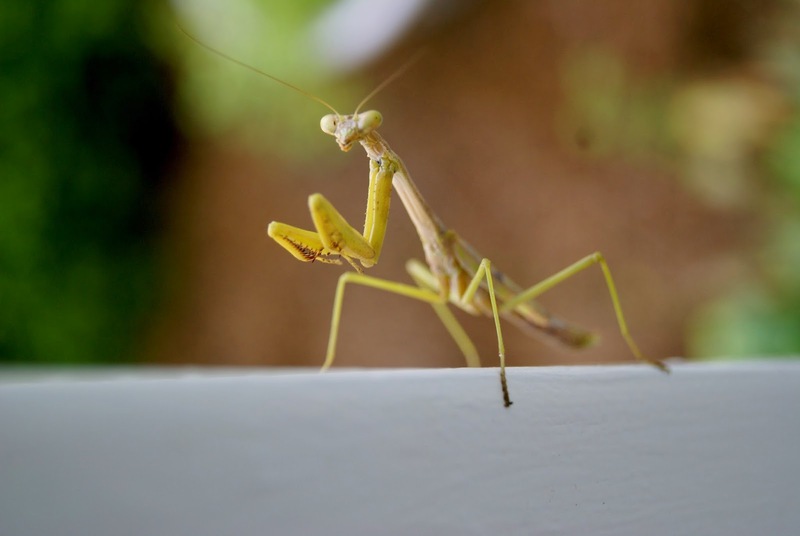 ~Grin~ So many times while I am preserving, I am praying for the one who will receive the food! 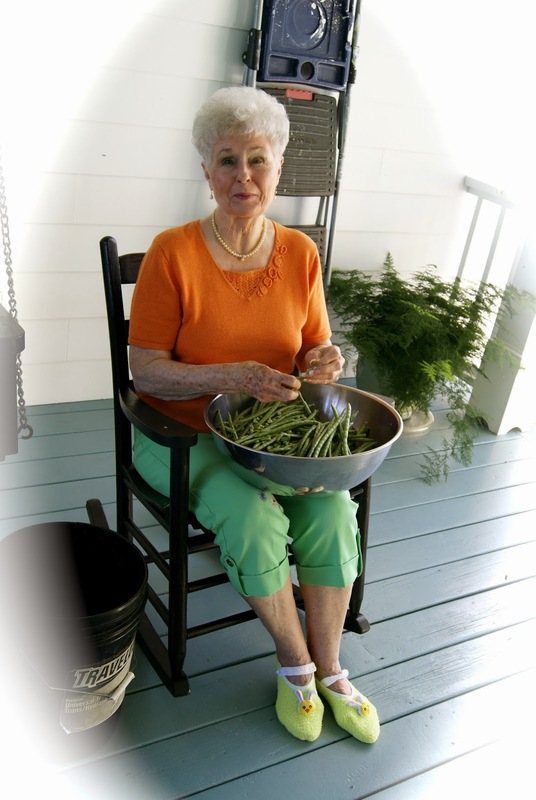 The best reward is when I get a phone call and a child says "Mom, you will never guess what we had for dinner last night, some of your peas, and corn, and it was so delicious!" 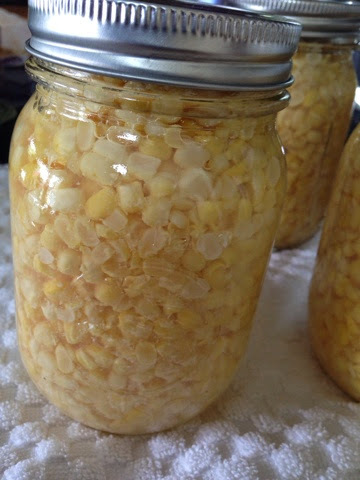 I will try and put the steps of canning corn in my recipe page soon. 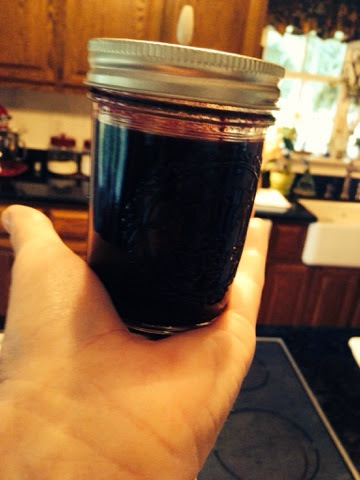 This is blueberry jam, I made 15 half pints this week, most for gift giving, before it is given it must be taste tested, by none other than Mr P. ahhh!! it passed with flying colors! A true cook will also taste her own concoctions, I call this a concoction because most times I never make something the same way. The recipe only called for sugar and berries, but Sue added cinnamon, lemon juice, a dash of vanilla flavoring, and several pats of butter,(the real thing). These extras only enhances he flavor of the berries! The color is so rich looking! 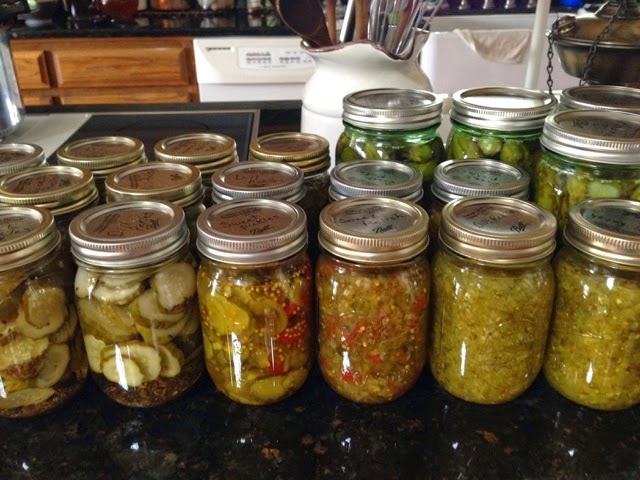 I will be finishing with the cucumbers, today,here are 5 kinds I have made, a most delicious sweet pickle recipe given by a friend, dill relish, sweet relish, Kosher dill, and dill chips! 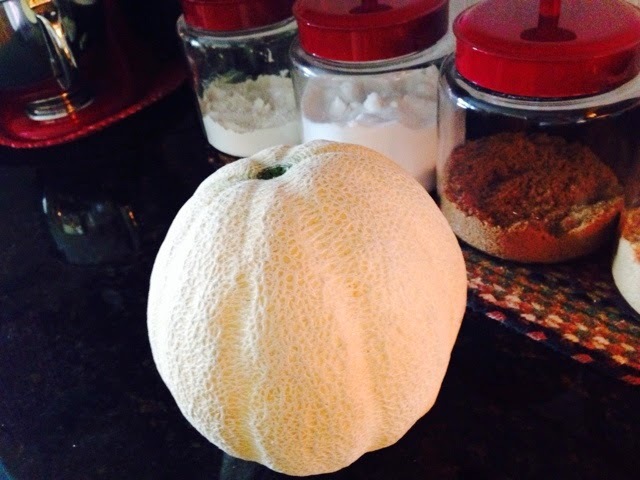 This is our first cantaloupe for the season, what a whopper, I asked Mr P. if there were more like this in the field, "Sorry this is the only large one" he replied. This will last for a while. ha ha you think? Per our usual routine first thing in the morning, we have coffee and devotions sitting on our porch, so what was different about yesterday? I was the first out and what did I see, a big pile of dung on the front lawn, actually there were four big piles that weren't there last evening. Folks! this is what freedom looks like!!! Na Na Boo Boo catch me if you can!!! This went on for about twenty minutes. Finally Pajama Cowboy got off the ATV opened the gate, and walked them through. You should have seen the look Rusty gave PJ Cowboy, it was like he was saying, "That's what you get for leaving the gate open, just wait until next time, it won't be so easy!""HE! HEEEE"
Now the sheep on the other hand were begging to leave their small pasture to get into the main pasture, go figure. It just goes to show that most creatures, animal and humans alike think "the grass is always greener on the other side!" ~smile~ There is never a dull moment on a farm when you have animals! Lots of thinks going on here at the farm, but first there is a wedding we must attend this weekend!! We are so happy for this young couple. Wishing you a most blessed,and safe Memorial Day weekend., as we remember those who gave, and continue to give their all that we might enjoy the freedoms we have! Personal note... To all of those who visited me at Vee's Note Card Party, I say "Thank you so much." I don't think I did this post justice, my only excuse is, I am so busy here at the farm, but I could not let the day go by without joining one of my favorite friend's party, and the hostess with the mostess. Thank you Vee for hosting. I will be by this evening to visit all of the guests, as we are working on a major work project today. Please join us at A Haven for Vee, and share photos that you think would make great notecards. Would you like to know how to....? Has anyone bought herbs at the grocery store lately, such high prices they are charging. 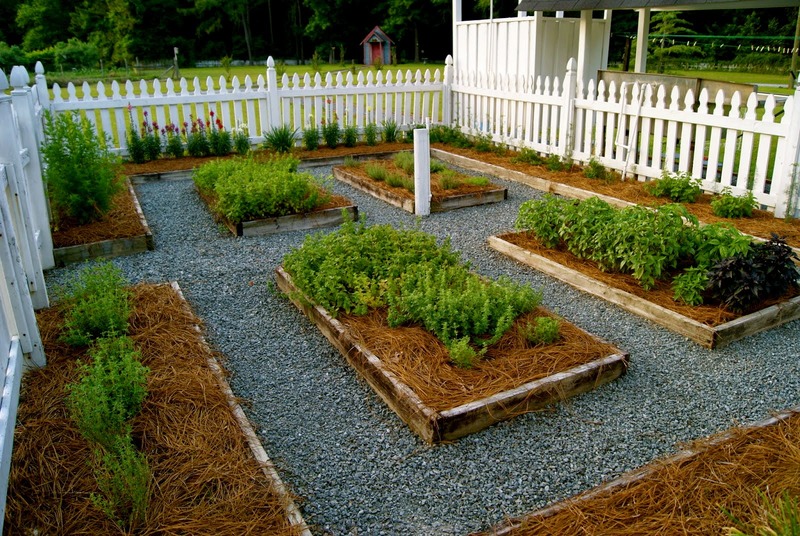 Do you use herbs, if so, I am here to tell you that you can grow, harvest, dry and make your own herb blends for minimum money..
You don't have to have a large space, herbs do well in containers, and in raised beds, they even like living among your flower beds. For some reason my herbs are producing early this year, last week, I gathered, different thyme's, oregano's, parsley, and marjoram. This week sage, and more of the same, herbs should be gathered about mid morning not early, as mid morning is when their flavors are at their peek for the day. Place in salad spinner, my salad spinner has become one of my best go to for veggies and herbs, makes work a lot easier and quicker, and quicker works for me, see that brown speck on the leaf it went the way of the trash can, always inspect leaves and stems. I then place them on the counter with paper toweling underneath, feed sack towels work well too! 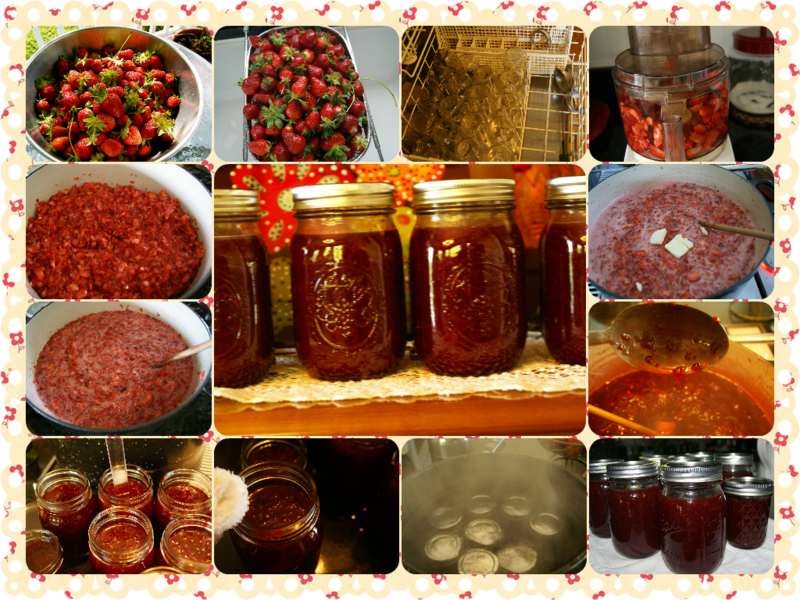 I also picked strawberries and made more jam. the old fashion way. When you air dry, you don't have to keep rotating trays, I bunched the herbs and placed a small rubber band around them, hung them on a wooden clothes dryer in a bedroom that is dark, this bedroom has a ceiling fan which I ran on low just to keep the air circulating. This is what the herbs look like today, coming along so nicely, I have added a bunch of Mother's Day roses and lavender to dry. Once they are dried I will show how I store them, so stay tuned. Not hard at all, was it. While out dead heading roses today I decided to bring a few inside along with more lavender to dry.I have some great ideas for using lavender, absolutely one of my favorite herbs. Our Strawberries are now producing, so what does one do with a big bowl of berries, make jam of course. If you don't grow your own , there are a lot of "pick your own farms" and local farmers markets. I am one of those who believes in supporting local farmers, besides the produce is always fresher. Pick berries, wash and drain them, sterilize the jars in dishwasher, place berries in food processor and pulse, measure in pot, add sugar and lemon juice, put on heat and cook, once the berries begin to boil you will notice foam on top, just place a big helping pat of butter in pot, the foam will dissipate, well almost, cook until jam sheets off of spoon or until the desired consistency, scoop into sterilized jars, wipe tops with clean wet cloth, then place sterilized caps and rings on and tighten, place into the boiling water bath, process for 12 minutes. This bowl of berries when chopped measured 16 cups of berries. And the secret ingredient is "Love". Tip: you might want to put the jam in decorative jars for gift giving, I will be doing this next time, but these will be going to my family who live far away. Hopefully I will remember to share some ways to make them more appealing, but you really don't need anything the "Jam" speaks for itself. 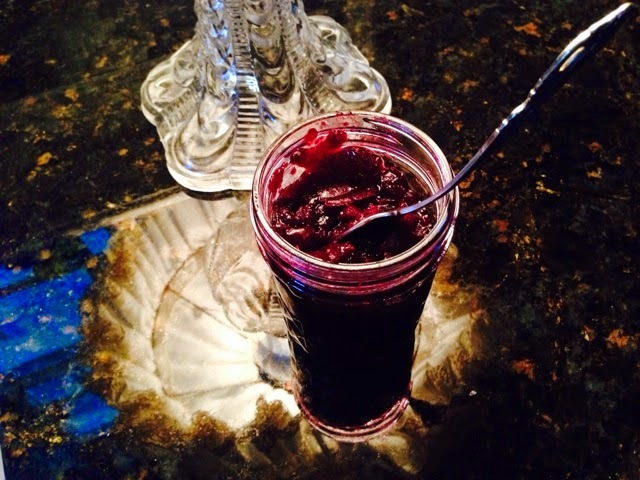 I can't remember when I last used Sure Jell, I am trying to keep everything as organic as possible, and to me there is a taste difference, having said that, feel free to use Sure jell, it certainly is quicker. I on the other hand take the time when stirring the pot to meditate, pray for loved ones, and listen to my favorite radio station, music always makes everything so much better. A word of encouragement to those who have never made jams and jellies, this process might seem a little over whelming to you, but trust me, it really is easy and so satisfying, as long as I have been doing this I always get such a wonderful feeling when I take the jars out of the water bath canner, and I hear the pop, pop, sound of them sealing, but the best reward is when someone says'"Wow! 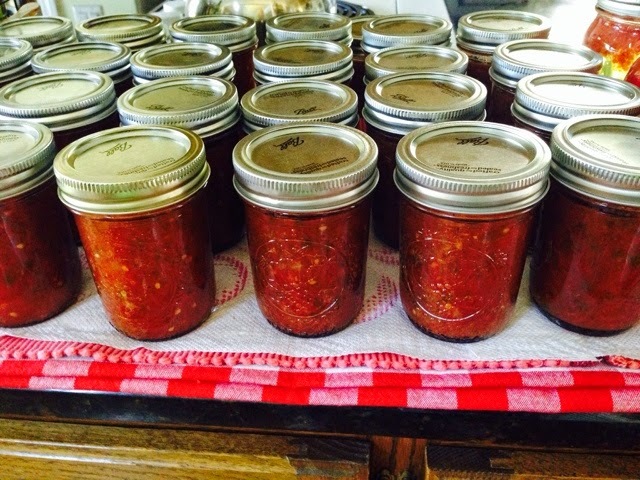 this is the best jam ever,"just as Dh did yesterday, as I always save him some, and just think you made it with your own loving hands! Just to prove how quickly this is, it only took 2 1/2 hours,from the time I brought the berries to the house, and they were sitting on my counter, time well spent! Thank you to all who stop by and take the time to read, and for your precious sweet comments, Please feel free to email me if you have any questions! 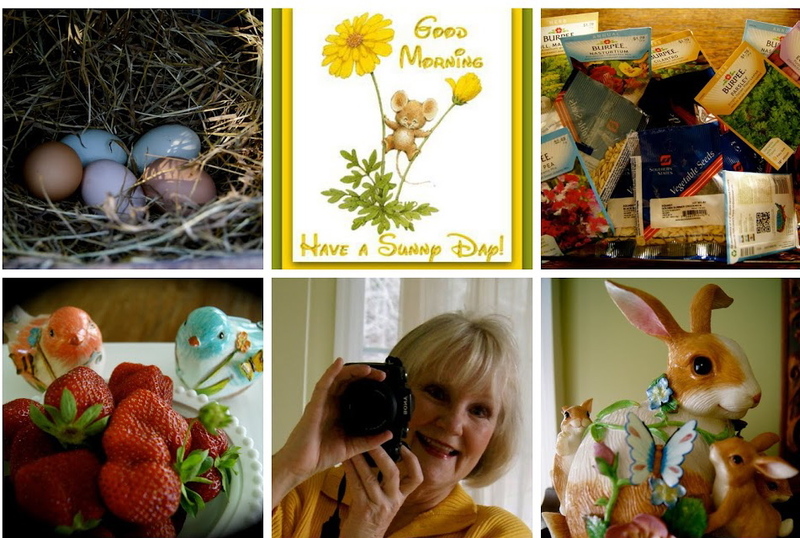 Written by Sue, Saturday, May 3, 2014 Beautiful sunny day, temps. 70's.Good day to a hang laundry outside. Thursday officially started my food preservation season for 2014, spinach and kale were the first to be gathered this year! It doesn't take a lot of space to plant a garden, ours is a little large, simply because we share with family and friends! It is hard to imagine that only a few weeks ago these were tiny seeds being planted into fertile soil, and with a little time, and nurturing,they are now ready to serve us. That's the way it is with our life as Christians we are planted in fertile soil, God nurtures us and after a while we are ready to be used of Him for His service. II Corinthians 9:10~ Now he who supplies seed to the sower and bread for food will also supply and increase your store of seed and will enlarge the harvest of your righteousness. Then placed in air tight Food Saver bags,... If I were using regular plastic bags I would blanch the leaves for a few minutes, cool in ice water then bag, I opted to try it this way to preserve the nutrients. I hope it works as I have had success with other vegetables. A Food Saver is a great investment! "Voila", ready for the freezer. 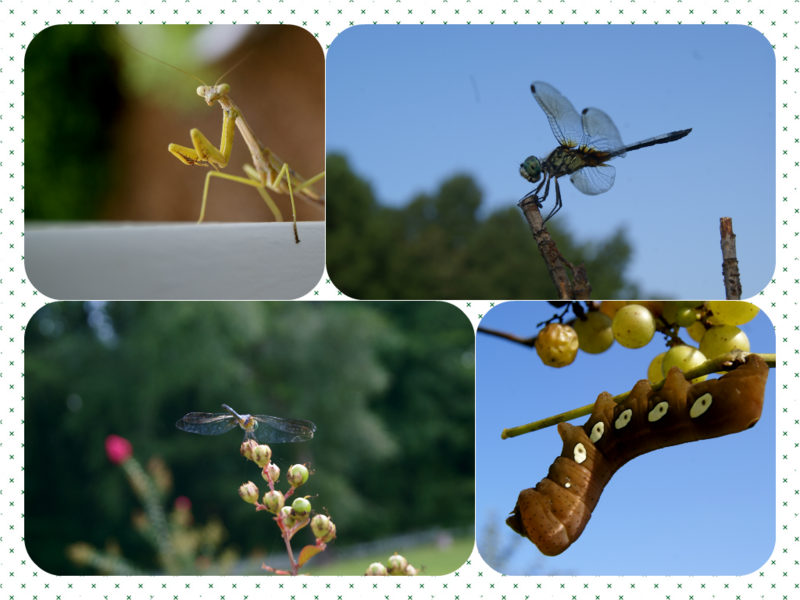 Yesterday, as Dh and I were working in the garden I said, "I could stay out here all day,"...and I did ~smile~ the weather was so comfortable, overcast skies with an occasional peeking of the sun, pulling weeds was actually not bad at all. I love gardening and being near God's creations, where all of my senses are touched in some way, I get to play in fresh air, kissed by the sun with the scent of honeysuckle flowing from the nearby woodlands, Our produce is organic, so tasting is always a must, rinsed first at the nearby faucet.~smile~ Watching butterflies flutter around the flowers, ladybugs feasting on aphids, toads, and the chameleons, along with the call of the Mourning Dove to its mate, birds singing. In the far distance I hear the nearby train whistle,(one of my favorite sounds) as it nears Beard Station. I have often wondered why I love this sound so much, occasionally, when I can't sleep at night, and the house is quiet I hear the train whistle again, it always makes me smile. Years ago towns were built near train tracks and near rivers, it was for necessities and made for easy travel! Life is simple here at Pear Tree Lane, but not without problems, but God is my strength and my refuge! Psalm 46:1 God is our refuge and strength, and ever present help in trouble.